Accessing historical and real‐time scientific data offers exciting teaching opportunities, yet teachers face many challenges utilizing real‐time data and incorporating it into their teaching. NOAA possesses an array of observing systems that monitor oceanic, atmospheric, and terrestrial parameters, but what's missing — according to an assessment by the Jacques Cousteau National Estuarine Research Reserve — are relevant, easy‐to‐use curriculum activities that put real‐time data into an exciting and compelling context as well as simple, intuitive computer interfaces for accessing online data. Within the curriculum modules, authentic research questions and supporting sub‐questions will be used by students to build hypotheses in the context of the scientific story. This method will draw out student preconceptions before their exploration of real‐time data in order to help assess progress toward understanding. Students will have to make a plan to test their individual or team hypotheses using the portal and tools for data manipulation. This method reinforces students' understanding of the content, context, and scientific processes. Finally, the curriculum modules will incorporate a scaled approach to learning to facilitate a transfer of knowledge from one project to another. Within the curriculum modules we develop, we will offer activities at five different scaled levels of interaction: Entry, Adoption, Adaptation, Interactivity, and Invention. Entry and adoption are very directive and teacher driven. However, they are important first steps when learning something new. 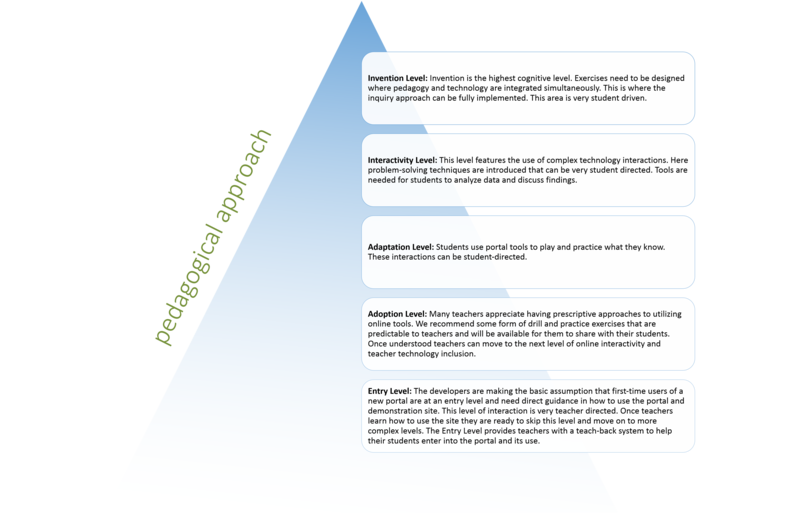 The levels of adaptation through invention are more student directed and open up opportunities to design lessons featuring student driven inquiry. Data in the Classroom is committed to developing resources that support the needs of educators. States and districts across the country are using the National Research Council report, A Framework for K-12 Science Education, to inform the design of their new standards. Key to the framework's design is three dimensional learning that includes science or engineering practice (SEP), a disciplinary core idea (DCI), and a crosscutting concept (CC). The activities in each Data in the Classroom module can be incorporated into an existing curriculum or unit of study to support this three dimensional learning. Learn more about how each module specifically relates to the Framework, as well as the Next Generation Science Standards, by visiting the Teacher Guide section of any of the online modules.